Once a year, the African-American community looks forward to the 28 days of February to recognize achievements, and celebrate historical contributions of the too-often neglected accomplishments of African-Americans throughout our nation’s history. In honor of Black History Month, California State University, Northridge’s festivities will officially kick off with Africana studies professor Aimee Glocke’s lecture, “Is the Black Aesthetic Dead? Posting the Black Aesthetic in the Era of Trap Music, Twerking and The Black Panther,” on Friday, Feb. 2, at 11 a.m. in the Flintridge Room of the University Student Union (USU) on the east side of the campus at 18111 Nordhoff St. in Northridge. 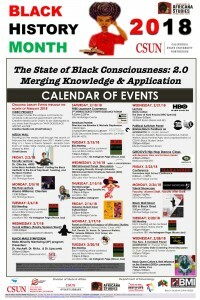 The theme of this year’s celebration is “State of Black Consciousness 2.0: Merging Knowledge and Applications.” The theme focuses on the generational consciousness — the concept of one generation trying to understand the previous generation’s plight to empower students of all ethnicities and generations to overcome adversities. Vocal Artillery (Poetry/Spoken Word) on Wednesday, Feb. 7, from 12-2 p.m. in the Oviatt Library Learning Commons. A series of step show(s) on the Oviatt Library portico and/or stairs. A discussion on Black Lives Matter LA and LA Black Panthers on Wednesday, Feb. 21, from 2-4 p.m. in the Ferman Presentation Room, featuring Melina Abdullah of Black Lives Matter LA and Harold Welton of LA Black Panthers. A screening of “The Nov. 4th Incident (The Storm at Valley State),” followed by a reception on Wednesday, Feb. 28, from 4-7 p.m.
Tuesday, Feb. 6, and Wednesday, Feb. 7, from 11 a.m.-2 p.m.
Tuesday, Feb. 13, and Wednesday, Feb. 14, from 1-4 p.m.
A lecture on hip hop by Alonzo Williams and Clientele on Monday, Feb. 5, from 12:30-2 p.m. in the Flintridge Room. The Black Male Symposium Male Minority (M3), presented by Hackett, CSUN political science professor Boris Ricks and social work professor Allen Lipscomb, will take place from 3-5 p.m. on Wednesday, Feb. 7, in the Whitsett Room of Sierra Hall on the west side of the campus. A screening of “American Promise,” with directors Joe Brewster and Michele Stephenson, will take place from 1-3:15 p.m. on Saturday, Feb. 10, at the Chatsworth branch of the Los Angeles Public Library at 21052 Devonshire St. The NBCUniversal Black Employee Network (BEN) Panel “Leveraging Diversity Through Adversity” will take place on Wednesday, Feb. 14, from 2:30-5 p.m. in the USU’s Lake View Terrace Room. A meeting of the Habesha Student Union will take place Friday, Feb. 16, from 5-8 p.m. in the USU’s Northridge Center. A historical panel examining the legacy of Africana studies will take place on Monday, Feb. 19, from 12:30-2 p.m. in the USU’s Flintridge Room. A screening of the HBO show “The Story of Hard Knocks” will take place on Wednesday, Feb. 21, from 12:30-2 p.m. in the Whitsett Room. GROOV3 Hip Hop Dance Class with Benjamin Allen & D.J. Black Rabbit will take place in Redwood Hall room 292 on Wednesday, Feb. 21, from 4:30- 6 p.m. The annual Harambee Conference will take place on Friday, Feb. 23, from 8:30 a.m.- 1 p.m. in the USU. The Black Wall Street Networking Event will take place in the USU’s Northridge Center on Monday, Feb. 26, from 3-5 p.m. The Faculty After Dark Talent Showcase will take place in the USU’s Grand Salon on Monday, Feb. 26, from 5-7 p.m.
On Feb. 27, the Pride Center will be hosting “BlaQ Future and BlaQ Magic: An Intersectional Evening with Chaz Ashley Cruz” from 5 p.m. – 7 p.m. in the USU’s Thousand Oaks Room. For more information about CSUN’s Black History Month activities, contact the Department of Africana Studies at (818) 677-3311.